Media from the Deep Geek Perspective. I’m Michelle from the Spartanburg County Public Library System. I’m a Teen Assistant, running several programs for teens at our library’s main branch. Some of the programs I oversee are the Secret Gamers Society, Cosplay Workshop, Outline & Design, and the Art Show Opening Reception. Other staff in our Teen Department run programs like Project: Anime, homeschooled, and Rock Out, just to name a few. For this post, I’ll be going over how I run some of my programs. Secret Gamers Society is our monthly tabletop game program, with the occasional popup program. Popups usually happen on days when there’s no other programs but we have a good number of teens to wrangle into a game. For the monthly program, I generally choose a game to feature as the main entry, with a focus on games I don’t think many of our teens have heard of or tried in hopes that they broaden their gaming horizons. I’ll also bring out other games, including ones that either relate to the theme of the program or games we’ve tried in previous sessions that they’d like to play again. It works well; oftentimes, after the program, they’ll want to stay and keep playing, or they’ll ask to play the game in the Teen Hub, our teen room. At times when the Secret Gamers aren’t gathering we still keep some games set out in the room for our teens to use with the rest filed away in the back of the office. (Those we circulate to other branches or let the teens borrow if they want to play one.) Sometimes the teens will even ask to have leave out the games we used for our Secret Gamers pop ups so they can borrow them for a few weeks afterwards. Cosplay Workshop is a monthly cosplay program that I started and built from the ground up shortly after becoming a Teen Assistant. Every month we focus on a different topic or material. Generally we have a craft or activity that relates to that topic, complete with a quick PowerPoint presentation that highlights various methods, materials, and tips before showcasing several different cosplayers relating to the topic at hand. 3D Printing: A guest speaker and friend of mine visited with two 3D printers, and various 3D printed cosplay props to talk in depth about and answer questions from our teens. For the duration of the program, we had the printer running so they could really see it in action, and afterwards we gave out some cool smaller 3D printed Bulbasaurs. Patterns: We talked about various pattern-making methods, and applied this new info to making pauldrons out of EVA foam, nylon, and buckles. Then we got out of the way and let them decorate it however they liked. Convention Masquerades: There’s a lot of variety in cosplay contests, so we went over the different types, looked at some rules and categories for them, and talked about what makes a good performance. Afterwards, we watched different cosplay stage performances and pointed out what helped to make it a good performance. Then, they all had the chance to come on stage and try out different walk with a variety of video game and instrumental soundtracks in the background. Some of them were light and playful, others were dramatic, spooky, or adventurous. Face Off: This one is fun, but always gets really messy. We talk briefly about different types of body paint, special effects, and makeup used in cosplay, and then they have a face off where they compete against each other to come up with the best look. Outline & Design is a program where patrons paint alongside me. I choose something fun to paint ahead of time and then, at the program, we’ll paint step-by-step together from start to finish. Some of the more successful Outline & Design programs have been space painting, where they paint different galaxy-themed environments and splatter painting, mostly because our teens really enjoy splattering paint. As a precaution, we take extra measures to keep the messiness contained, such as using old banners as tarps on the tables and around the floor when necessary, and monitoring how hard or at what angle they choose to splatter paint. Every month we feature a teen artist on the walls of our teen room. 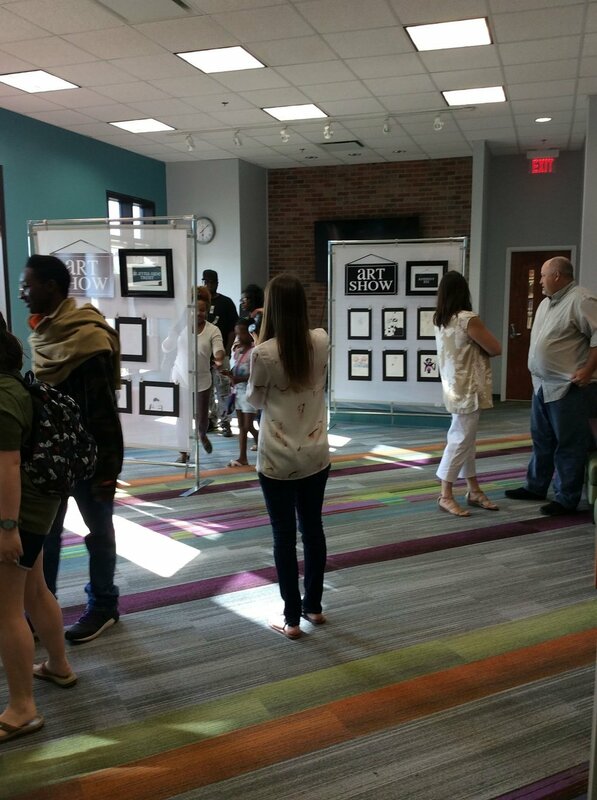 For the Art Show Opening Reception, that teen and the teens for the next two months are encouraged to invite their friends and family to enjoy refreshments and show their support. It’s a win-win situation because we get to look at beautiful art on our walls everyday, and they get to show off their art in a public space. If you’d like to see more of what we do in the Teen Department, then follow us on Instagram at www.instagramcom/scplteens and Facebook at www.facebook.com/scplteens or email us at teens@infodepot.org! Games in Schools and Libraries is produced in association with Inverse Genius and the Georgetown County Library System. Posted on January 11, 2019 by Donald Dennis and filed under Library Programming and tagged guest post Michelle Chavez Spartanburg County Public Library System. Powered by Squarespace. Images provided by Donald Dennis, Erik Dewey, and Isaac Shalev, some rights reserved.